What would be the purpose of reading so many blog posts if no inspiration took place? Isn't that the point? 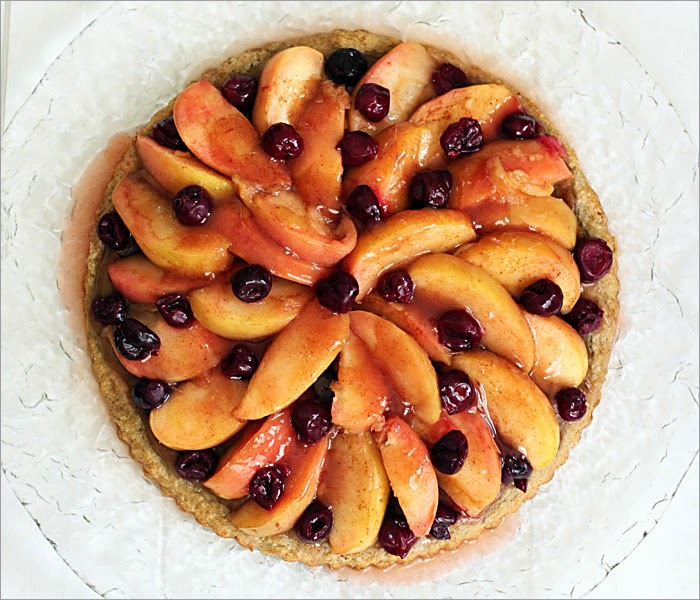 I was inspired to make an apple tart by a post on Seitan is my motor, where Mihl has been tirelessly whipping up one spectacular classic German dessert after another. She made a dessert called Erdbeerboden that had a crust she called sponge cake. But because Erdbeerboden means strawberry cake, mine would be have to be called something else, though I have no idea what that might be — apfelboden? But it also had cherries and dates, so I don't know. The fragrant, cooling crust, before being removed from the pan. I had to de-glutenize the crust, but it wasn't hard, and it still seemed springy and spongy to me. I used an 11-inch tart pan with a removable bottom. The sides didn't stick at all, and after loosening the cake from the pan bottom a bit with a knife, the cake released intact from the pan. I completely forgot to line the pan with a circle of parchment, which would have made removal even easier. Grind the chia to a powder in a high-speed blender, then add the hot water and emulsify. Whisk the sugar, two flours, baking powder and arrowroot together in a large bowl. Add the chia-water, oil, and vanilla, and mix with a electric hand mixer (if you have one) until smooth (about one minute). 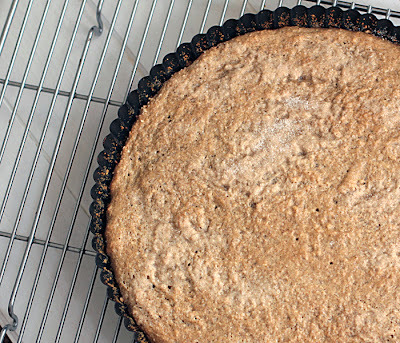 Place the batter in the tart pan and bake at 400˚F for 15 minutes, or until golden. Let cool on a rack before loosening and removing the cake from the pan. Now head to Mihl's post for complete directions, and the more traditional, non-gluten-free version. 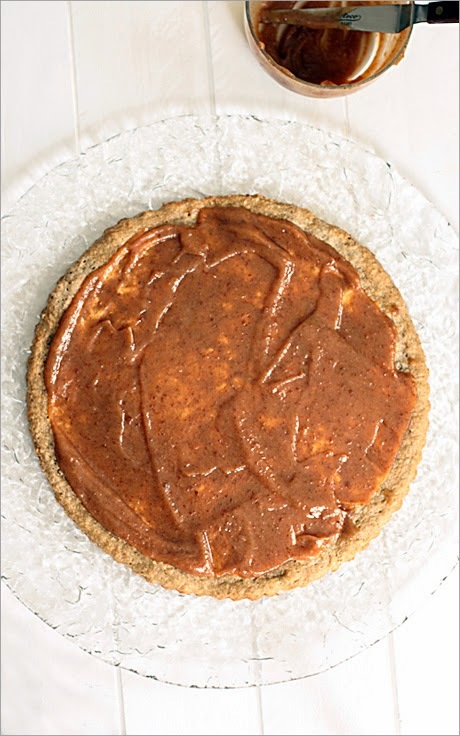 The caramel sauce spread onto the cooled crust. The cake before being glazed. Speaking of the apples, although Kristy's post provided the inspiration to cook the apples in a slow cooker, and combine them with caramel, my first experience with cooking apples and other fruit in a slow cooker was when I tested recipes for Robin Robertson's book, Fresh From the Vegan Slow Cooker. The results were so rich and flavorful that I used my slow cooker for the apples in this recipe with the hope of adding intensity to the flavor. I sort of followed Kristy's no-sugar recipe with a little additional water, but shortened the cooking time, cooking just until the apples were tender but still held their shape. I really love my slow cooker. The final piece took me back to Mihl's blog again to make a glaze. I used the liquid left from cooking the apples, the soaking water from the dates and liquid left from cooking the cherries, and a small amount of sugar. I made the glaze using both arrowroot and agar agar flakes because I wanted it to be a little soft, rather than a hard jelly. Sweeten the liquid to taste. Sprinkle the agar agar over the cold liquid and let it sit for five minutes. Place the arrowroot in a small dish and add 1 tablespoon liquid. Stir to dissolve, then add to the agar agar mixture. Heat the glaze until it bubbles, turn to simmer, and cook until thickened, about five minutes. Pour the glaze over the fruit and refrigerate the cake so the glaze can set. Then, eat the cake. Thank you Mihl and Kristy. So incredibly pretty. Love Mihl's blog, and yours, too, of course. It's a stunning cake! Beautiful! I am pretty sure Mihl is a goddess, or at least a demi-goddess, because to whip up such fabulous desserts every single day one cannot be a mere human. And they all have accompanying recipes! Mihl for president of the world! I agree. She obviously has super powers I can only dream of — you, on the other hand, are quite an adept baker! But a showcase recipe every day in spite of a job and a toddler — president material at the least. Just gorgeous, Andrea. All that talk of caramel made me forget there were apples on there. Thank you Abby. It may have made you (temporarily) forget about the apples, but it didn't make my son forget about the cinnamon. Doesn't everybody like cinnamon? You are absolutely right about reading blogs for inspiration and recipes. Looks like you were indeed inspired, and turned out a beautiful peachykeenboden with caramelboden. Except that I used apples. 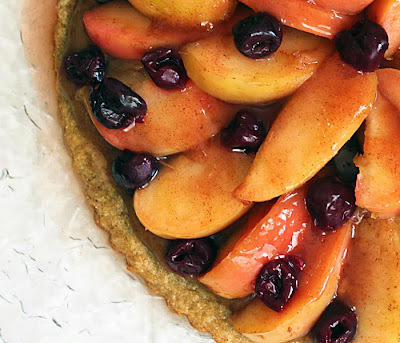 Apples are also peachy-keen, right? 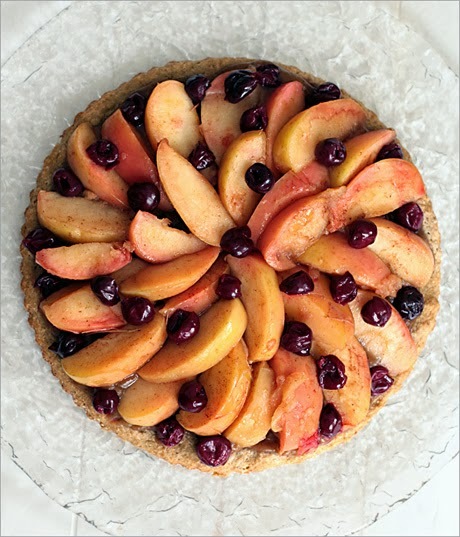 Oh my goodness, Andrea, that is a gorgeous cake/tart! You make me wish I had a tart pan :-) You have definitely inspired me to make something with apples--I love to eat them out of hand and I often forget how lovely they are cooked. I need to make some baked apple creations soon! Thanks. I think my favorite apple dessert is baked apples — simple and delicious. About the tart pan ... I don't use it often but when I do, it's always exciting. I want a smaller one, too. I also have mini tart pans that I got at a garage sale and those are a lot of fun to use. What a gorgeous cake. Sponge cake is really special. Was it spongy enough to soak up the caramel sauce? Or was it thicker than that? Yes, it did soak up the sauce — I couldn't decide if that was a good thing or a bad thing. The cake crust had a very cool texture and I have ideas for using it again soon. Thank you. I hardly ever make decorative desserts, but it's fun when it works out! wow!! aren't you just a creative little kitchen genie??? De-glutenizing, fruit-adapting, and recipe combining! All with great success! I'm very impressed. It looks so totally beautiful. I have been loving (and drooling over) Mihl's mofo posts. I guess I just need to bookmark every single one! Hmm. Yeah. My desserts are usually less decorative than this. Mihl has been driving me a little crazy with all her gorgeous desserts — not necessarily because I want to eat them, but because all her creations are so beautiful, I just want to stare at them. Looks and sounds gorgeous :) I have to try it. This is amazing, Andrea! Thank you for making this gluten-free. I often think of you and how you can never make a single thing from my blog. I'll safe this recipe and make this for our gf-friends. They are going to be thrilled. Oh my, Andrea, this looks & sounds amazing! I used to not care for cherries too much but love them now. I turned out really pretty, too! So beautiful! I can see why you were inspired by both of those recipes. Your results are certainly magnificent! Thank you. It always helps to have good inspiration. That looks so pretty! The idea of date caramel is stuck in my head now! You should make some — and eat it from a spoon or on ice cream. Or, is there a dish you're planning to veganize that requires caramel? I love how you found inspiration from several vegan bloggers! This dish looks beautiful. I recently made the salted caramel sauce from Kristy's blog as well. It was delicious! I had to use the smallest cup on my magic bullet to get it to blend so it wasn't as smooth as I would have liked but as you say, it's tough with the small amount of dates. I would definitely eat this with some vanilla ice cream. Delicious! Both my food processor and Vitamix ignored the dates, which is why I ended up adding liquid. It was good, but I'm sure it would have been even better undiluted. this not only sounds incredibly delicious, but it looks beautiful! Thanks. If you haven't seen Mihl's blog of amazing desserts, you should go take a look..